I'm a little annoyed at the moment. 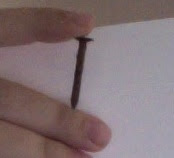 I mean, waking up feeling like I'd been on the losing end of a barroom brawl wasn't the start to the day I'd been hoping for (although it was the one I expected after going to bed feeling like the nail was still in my foot). This time I was determined to carefully follow the care instructions they'd given me at the hospital and right at 9 I called the office of the doctor that our new insurance had assigned me and, after fifteen minutes on hold, was put through to an actual person and tried to make an appointment. An actual doctor, I thought. Not a low income clinic. This was going to be awesome. I gave the name of the doctor I was supposed to see and was immediately told that that wasn't a real doctor, that it was just the name of a resident that was used for billing purposes (red flag #1?). Okay... so could I make an appointment with a real person? Any real person? Because I have this rusty hole in my foot and I'd really appreciate it, since, at the moment, as antibiotic time approaches my foot feels increasingly burn-y and hot. And it really hurts, despite the narcotics I'd rather not be taking, but am because I'd rather no go into labor from the pain (and pretty much anything seems to start the contractions these days). Who knew that poking a hole through my foot would make everything hurt? My favorite sports in college included tournament fighting, rugby and surfing and I have to say that this feeling is comparable to a very bad day in any of those activities (and since, for me, those activities involved a ruptured disk and a number of broken bones, that's not a good thing!). And then the receptionist says she can get me in, in late October or early November, as soon as I've filled out my new patient packet and had all my records from my old doctor's office transfered to them. As soon as they receive those, they'll call me to make an appointment. In my most patient voice I give her the benefit of the doubt and hope that maybe she missed the "I have a rusty hole in my foot and need to see someone ASAP" part of the conversation, and repeat myself, asking if I really have to wait until November for this particular problem. She checks and says "Yes." I decide not to point out the two minute spiel at the beginning of their message that claims they make same day appointments every day (I guess they do if you've already gone through intake... but if you've just been assigned to them your out of luck...). This would be the hospital's primary care office that I'm talking to... She brings up my records from yesterday, which I know include a spectacular x-ray of a nail in my foot, and confirms: one to two months for an appointment. So she'll just send me the paper work and I can have my records faxed over, okay? I explain, the frustration in my voice beginning to show through despite my best efforts, that I've been seen at low income clinics for the past couple of years so that will be difficult. My records aren't all in one place. She tells me I can do my best and then they'll call to make an appointment if I still need one (um... you mean if I'm not dead from some rubber soled/rusty nail/ fertilized garden infection?). Oh and if I need a follow up I can always head over to the ER to be seen! Do I still want a packet? (I begin to wonder if she's purposefully trying to discourage me from using their practice). I say yes. Just in case something else happens, you know, post packet. Now to call my insurance carrier and see if they can give me an office that doesn't stink quite so much. Maybe one that has real doctors and not just "names we use for billing." Because I'd really rather not use the packet she's mailing to me if I can help it. Now I'm going to snuggle up under Sadie's Cars Snuggie and hope that the girls tea party lasts all morning long (I just heard: "Here, now it's your turn," which is promising...). And I'll go back to moping offering up how much this hurts (I always have these grand "offering it up" plans when I'm completely comfortable and the reality always proves just how far I am from those great imagined goals...). Oh, Cam, I am so sorry you're having to deal with this. Are there urgent care clinics near you that your insurance will cover? You simply can't mess around with this... I won't scare you with stories, but please keep a very close eye on your foot and any other symptoms, and don't wait a minute if you think the antibiotics aren't doing their job. Lots of prayers being said for you. God bless. Poor Cam, I can't imagine a worse fate, although the thought of suddenly having time to knit and do computer stuff, does make me a bit envious :). Hope your doctor situation works out, that sounds really frustrating.